There was a time when gaming laptops were super expensive, bulky pieces of hardware reserved only for the super-rich. 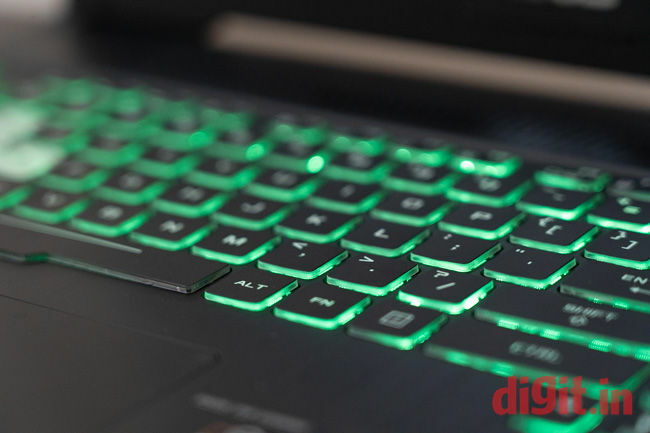 However, with demand for powerful and portable hardware rising, OEMs have been hard at work creating more options for buyers and the result is that gaming laptops now exist in many avatars and start at as little as Rs 60000. Asus too joined the bandwagon of economically priced laptops earlier this year with its TUF series (FX504) and just 6 months later, the series is seeing another addition. Asus has today launched the Asus TUF Gaming FX505, a higher grade of hardware than what is available right now. 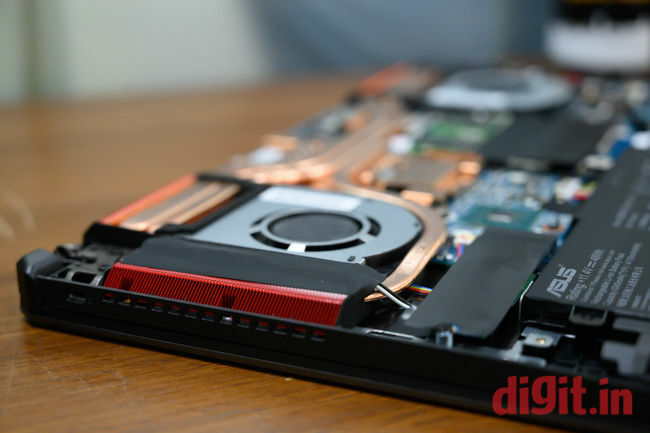 We reviewed the 15” model powered by an Intel Core i7-8750H processor, 16GB of DDR4 (2666MHz) RAM mated with a Nvidia 1060 (6GB) and most notably, a full HD IPS display with a refresh rate of 144MHz. This configuration costs Rs 129,990 in India, and we put the laptop through its paces to see if it’s worth the money. Asus continues to use ROG-inspired “Radiating X-design” for the laptop. Nomenclature aside, the design isn’t minimal enough for you to walk into a boardroom meeting, with its red exhaust fins and aggressive cuts on the lid. There are multiple elements to the build and design of this laptop that need discussion. 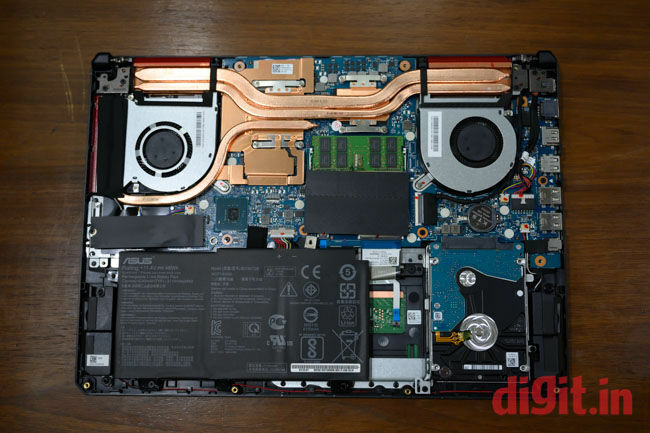 At first, when I opened and used the laptop, I found that there was a noticeable flex on the outer shell of the lid and uneven lift on the hinges. When opening the lid with one hand, the lift is uneven and the display seems to bend by a few degrees. This isn’t a flaw in the build quality, but an essential choice. You see, the FX505 finally lives up to its “TUF” moniker, bringing with it the MIL.STD810G rating. This means the laptop has been drop tested to withstand falls from heights of up to 1m and we too dropped the laptop a few times to see if Asus’s claims were true. The laptop survived three drops, at which point it was decided that we shouldn’t push our luck. The softness or flex in the lid and other parts of the laptop are what allow it to absorb the shock generated by a fall. Moving on, the laptop design has changed somewhat from its predecessor. All the ports are on the left side of the laptop so as to eliminate any interference one might face while using the mouse. This is a great design choice for the most part, unless you’re left handed and use the mouse on the left side of the laptop. The right side gets an additional exhaust port for the heat generated, which we do not mind. 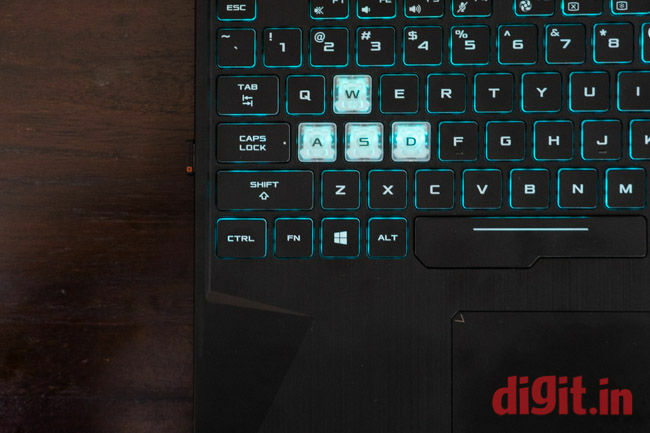 More cooling is always better when it comes to gaming laptops. The display used in the review unit we received is a full HD IPS panel which had 98 percent sRGB colour reproduction as per our Spyder colour calibration tool. The viewing angle was slightly lower than the usual 178-degree, but that’s okay given that this display is meant to be used with the person sitting right in front of it. However, if you and two additional friends did decide to watch a movie on this together, you won’t be losing the visual fidelity in any way. What helps is the fact that Asus has finally decided to narrow down the bezels on the display panel to just 6.5mm, so things feel more immersive. We tested the display’s visual acuity on multiple games and photo and video editing tools and concluded that the display does its job extremely well. While playing Doom on ultra settings, the visuals were butter smooth with frame rates as high as 120Hz. There was no jitter while racing through the open world of Forza Horizon 4 in a Bugati Chiron either. When using the laptop for editing photos and videos, the display needed to first be calibrated as it was not factory calibrated and showed a DeltaE of 3.2. After calibrating the display, we were able to carry out colour correction on both video and photos with great accuracy. We verified the colour integrity of the content by viewing it on a Dell Ultrasharp monitor with perfect colour accuracy. What we concluded after using the laptop for 10 days for gaming, editing and watching movies is that the display on the TUF Gaming FX505 is a big step up from its predecessor, which had a 120Hz TN panel. This variant now sports a far more colour accurate IPS display with a 144Hz refresh rate and honestly, this leaves little room for any complaints. The Asus TUF Gaming FX505 sports a full sized keyboard with adequate spacing between each key. The WASD keys are transparent so as to make them stand out, which is mostly just a visual touch than a functional benefit. The keys have RGB backlighting but does not offer any zones. The keys have 0.25mm curvature for a seamless fit with the fingers and a 20mm travel. However, thanks to the Overstroke technology from ROG, the distance to actuation is halved. What this means is that the keystroke doesn’t take a lot of force and the extra travel distance makes the keyboard an absolute delight to type on. However, there are some gripes with the keyboard. First, there is some flex on the island within which the keyboard is housed. While this may not impact gaming as much, it does make long typing sessions a little awkward. Second, the placement of the arrow keys is questionable, with the top arrow being in line with the lowermost part of the keyboard and the remaining three keys being a little lower. The arrangement causes a little clutter on the right side and it’s easy to hit the CTRL or 0 key on either side of the arrow key, as we often experienced. Maybe a little spacing could alleviate this issue but given how little space there is on laptops with full-sized keyboards, it’s unlikely that a better implementation would come around. The Asus TUF Gaming FX505 offers a generous trackpad which supports Windows precision drivers. The matte surface makes gliding your fingers on it super easy and the cursor responds with great accuracy. You could potentially get into a casual FPS gaming session using just the trackpad if you wanted, but the buttons have more travel than I’d like. Give that the mouse click has longer travel than normal, the shooting process takes a hair longer than it would when using a regular mouse. While it may not be perfect for gaming, it is sufficiently precise to manipulate footage on the Adobe Premiere timeline or move adjustment sliders around in Lightroom. In fact, we were also able to use the trackpad for editing a photo in Photoshop using the Lasso tool. In short, the trackpad works really well for the most part, but if you want to get into competitive gaming, you will absolutely need an external mouse. The Asus Tuf Gaming FX505 comes with two drives. The first is a 256GB Western Digital NVMe drive and the secondary drive is a 1TB Seagate Firecuda SSHD. 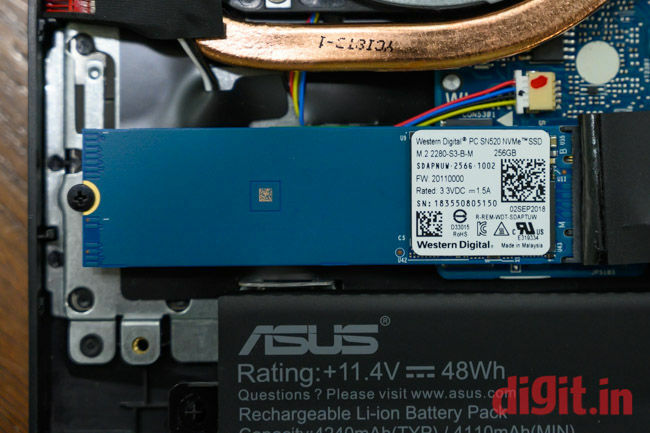 From now on, the 256GB NVMe will be a standard across all base Asus gaming laptops and the SSHD is already what Asus uses. Both the drives are user upgradeable, and you can add up to a 1TB NMVe drive and an 8TB SSHD to the FX505. However, if you do decide to upgrade, doing so by yourself will void the warranty. You can buy your own parts, but you will have to have the upgrade be performed at an Asus authorised service centre. This is to ensure that whatever parts you’re upgrading to are compatible with the machine and do not cause further problems. Onto the performance of the drives, the primary NVMe drive clocked a score of 1723 MB/s and 814MB/s on read-write respectively, the FireCuda did not fare as well and scored only 137MB/s and 127MB/s respectively. In real life, this translates to games like Shadow of the Tomb Raider and Metro: Last Light taking up to 10 seconds longer to load when installed on the secondary drive. While load times may be longer, the gameplay itself is not impacted by the choice of install-drive. If you’re impatient like some of us, then you may want to invest in a higher capacity NVMe drive as 250GB just won't be enough. For photo and video editing, the secondary drive was adequately fast. We loaded 500 images shot from a Nikon D850 into the secondary drive along with 28GB of FullHD footage also shot from the Nikon D850. While Lightroom stuttered only once in a while, we did have some issues in Premiere while scrubbing through the timeline. The secondary drive was not fast enough to allow butter smooth scrubbing of the timeline, creating some stutter every now and then. However, once the footage was moved to the NVMe drive, the edits were blazing fast and premiere faced no issues. 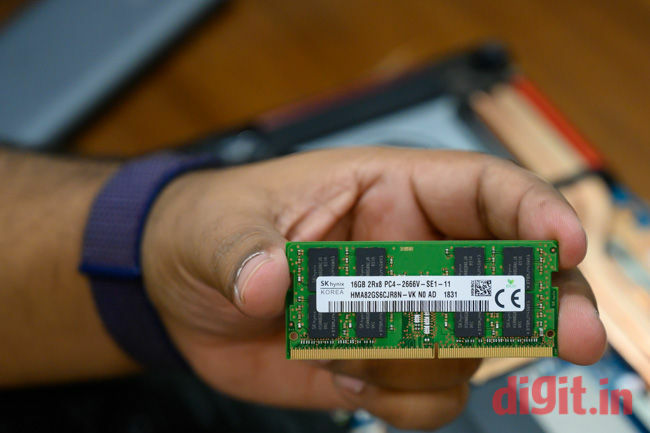 While the drive combination is fast enough for most things, you would be getting a whole lot more out of the hardware if you were to upgrade to a SATA SSD or even a bigger capacity NVMe drive, if you can afford it. Now to get to the meat of the matter. 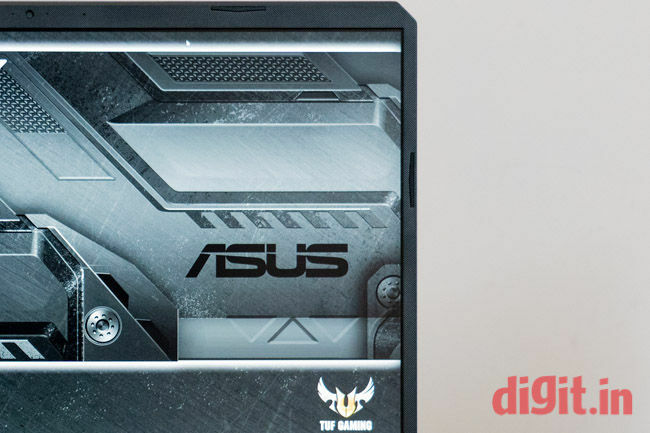 The Asus TUF Gaming FX505 that we reviewed came with the 8th generation Intel Core i7 - 8750H. The processor is accompanied by 16GB of DDR4 RAM clocked at 2666MHz which is slotted into one of the 2 DIMM slots on the motherboard. One free slot means you can always jazz this machine up with 32GB RAM. Beside the processor is the Nvidia GTX 1060 with 6GB video memory, enough to push most games to high frame rates supported by the display. 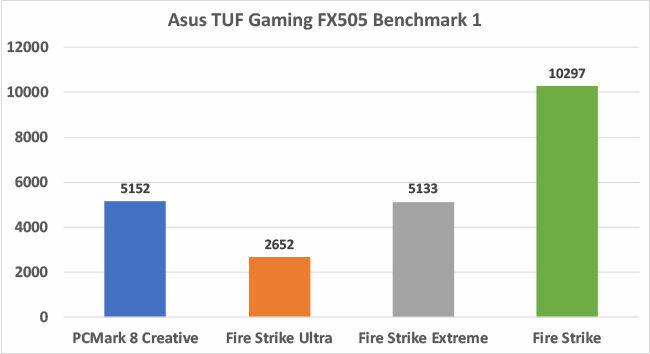 We corroborated this with benchmarks, where the FX505 scored 5133 in FireStrike Extreme and 133875 on IceStorm Extreme. Unigine heaven revealed a final score of 2610 with an average frame rate of 103 fps. While the benchmark performance of the machine was impressive, what really mattered is how it would handle games. So tested the machine with Doom, Forza Horizon 4, Shadow of the Tomb Raider, Metro Last Light and WolfensteinII: New Colossus. All games were set to their highest possible graphics setting. On average, we managed to play each of the above games at a 100fps. Doom is an impressively optimised game so needless to say, it was incredibly fun to play at the ultra-graphics settings on the FX505. For someone used to playing at 60 or even 30fps (god we hope not) the high frame rate on Doom really help take demons down with ease. When playing Forza Horizon 4, the 144Hz refresh rate really helps emphasize the fast-moving environment. When you’re racing a Lamborghini Aventador across uncharted fields, the paddy flying across the car looks so realistic. What felt spectacular was playing Wolfenstein II, where every explosion and every battle feels almost real. The GTX 1060 and the Core i7 really do get pushed to the max while gaming and even though we didn’t see frame rates be sustained at the 144Hz number. Only when the graphics settings were reduced did the FX505 hit the target frame rate. One thing about gaming laptops is that they also double up as excellent machines for creative people. The powerful hardware and especially the Nvidia dedicated graphics cards help Adobe programs run at their best, but if you’re using other tools like DaVinci Resolve, OnOne editing suite etc. Personally, I built myself a gaming desktop just to be able to edit RAW 4K footage without a single stutter. So when a gaming laptop comes along, the first thing to do is load it up with all of the usual set of editing tools. We use Premiere, Photoshop and Lightroom extensively on a daily basis and that’s where this laptop comes in handy. We initially tried to use the secondary internal drive for storing our photo and video data, but chose to use an external drive instead since there was too much to hold. Photo editing whether its large RAW files in Lightroom or individual files in Photoshop, we found no issues whatsoever in executing the task. The Asus TUF Gaming FX505 took close to 18 minutes to export 50 full resolution JPG files from RAW files, which is pretty good for the hardware. Video editing worked well too for the most part, but we hit performance snag while colour correcting our fullHD footage in both Premiere Pro CC and DaVinci Resolve. Colour grading is usually a very hardware intensive task and especially with a 2K display connected via the HDMI2.0 port, things can get a little difficult. Long story short, this is a great machine for photo and video editors, but colourists could use with beefier hardware. Both the Intel Core i7 8750H and the Nvidia GTX 1060 are power hungry chips and consequently, they also generate a lot of heat. We popped the lid off the Asus TUF Gaming FX505 and found a generous dose of thermal management. 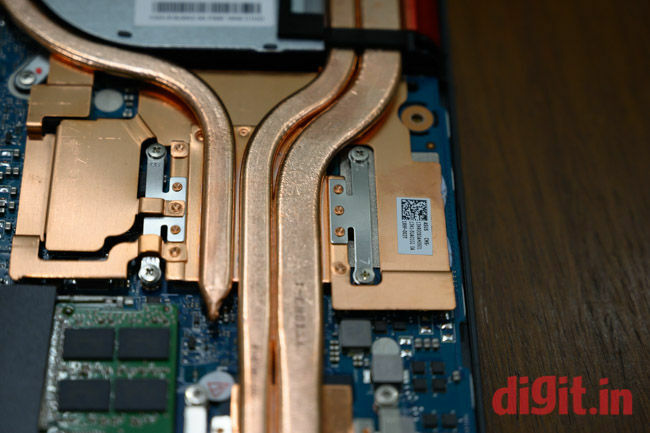 The FX504 that came before this laptop had two copper pipes over the GPU and one over the processor. This time around, Asus has increased the amount of copper, with the GPU getting three copper pipes running over it and two going over the processor. There are exhaust vents at the back and an additional one on the right side to facilitate excellent airflow. The result of all this is that the FX505 manages to stay reasonably cool throughout our gaming and rendering sessions. The dual fans did kick up to max rather quickly and they can be loud, but if you’re playing with headphones on, you won’t notice. Probably one of the most ingenuous ways in which Asus keeps the laptop feeling cool is by pulling in air from the area around the WASD keys. What this results in is a cooler feeling laptop on the surface, along with your fingers. This is especially handy when you live in a hot place. The FX505 however did get noticeably hot on the top right side, pushing our temperature gun to 49 degrees. 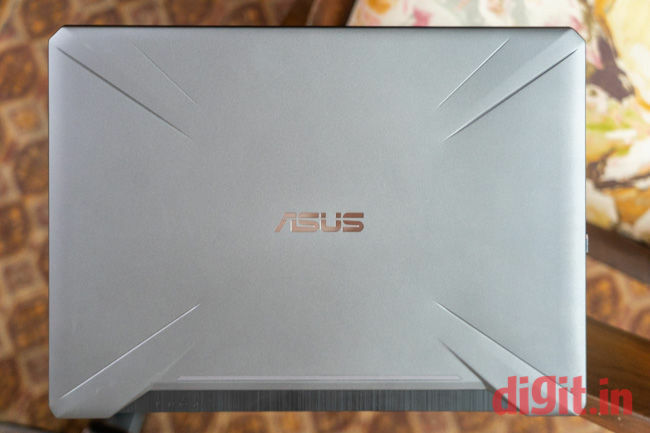 The Asus TUF Gaming FX505 is not a cheap laptop by any means. Powered by Intel’s 8th gen Core i7 chip and Nvidia GTX 1060, the machine has the chops to make it a legit gaming machine. It offers enough juice to run all your demanding games right out of the box and yet, offers you plenty of room for upgrades. The MIL.STD-810G rating is definitely a boon to have but having that adds considerable flex to the body and the keyboard island. In terms of I/O, the machine could have done with more USB 3.1 gen 1 ports. What’s even more of a surprise is that this costs Rs 10,000 less than the Asus ROG GL504 with the same configuration, but with 4 zone RGB lighting and a better design. Additionally, you get the ROG branding, which carries its own premium. While the FX505 is a pretty solid machine in of itself, it is priced a tad on the higher side, especially given how you can get an ROG for almost the same price. Thankfully, Asus has not discontinued the FX504 lineup of gaming laptops sop you could always turn to those if you’re on a tight budget.